The husband wife duo of Ian Tyson and Sylvia Fricker were Canadian music pioneers and a big part of the early 60s folk music boom. Though they never had a hit single, You Were On My Mind is Ian & Sylvia's signature song especially after We Five scored a big hit with it in 1965. Ian Tyson was born Sept. 25, 1933 in Victoria, BC. He was a rodeo rider as a teen. But he got injured and he took up the guitar. Tyson acknowledges Canadian country music pioneer Wilf Carter as an influence. He started playing Vancouver clubs while attending the Vancouver School of Art. After graduating, Tyson moved to Toronto to take a commercial art job. That's where he met Sylvia Fricker. She was born Sept. 19, 1940 in Chatham, ON. Her mom was a church organist and choir leader. Sylvia always wanted to be a singer so she moved to Toronto in 1959. Ian & Sylvia started performing together in Toronto clubs. In 1962, they moved to New York. They got the attention of Albert Grossman who managed Peter, Paul & Mary and Bob Dylan. He got them a record deal with Vanguard Records. They released their debut album and performed at the 1963 Newport Folk Festival. They married in 1964. You Were On My Mind is from the 1964 album Northern Journey. Though You Were On My Mind was not a hit at the time, it became a hit in 1965 when We Five leader Michael Stewart wrote an uptempo arrangement that was more commercial. Folk music purists complained at the time. But I don't think Sylvia complained about the royalty cheques she got in the mail. 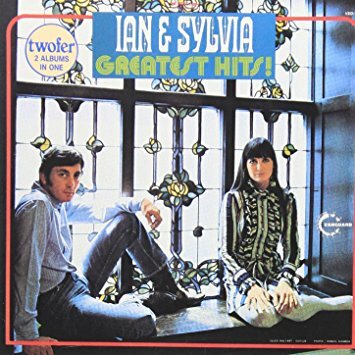 Ian & Sylvia were successful mostly in Canada with hits like Four Strong Winds and Gordon Lightfoot's Early Morning Rain. This budget comp covers their Vanguard recordings. It was first released in 1970 as a 2LP set and released on CD in 1987 as a "twofer". Ian & Sylvia became more of a folk rock act in the late 60s. They left Vanguard for MGM in 1967. They formed Great Speckled Bird and released a Todd Rundgren produced album in 1970. That album was hurt by poor distribution but it is worth seeking out. Then they recorded two albums for Columbia that went nowhere and they divorced in 1975. 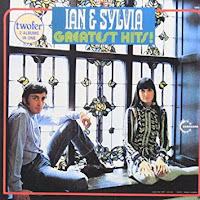 Ian & Sylvia have had significant solo careers in Canada. They reunited for a 1986 CBC TV special which you can watch on Youtube. Here's Ian & Sylvia performing You Were On My Mind on the 1986 CBC TV special The Ian & Sylvia Reunion.